Iranians stay outside their building following the quake. A 7.3-magnitude earthquake rattled the northern border region between Iran and Iraq, killing over 328 people and injuring 3,950 others and triggering landslides that were hindering the rescue effort, said a BBC report. Tremors were felt all over the region, including the Gulf countries. Footage posted on Twitter showed people fleeing a building in Sulaimaniyah, northern Iraq, as windows shattered at the moment the quake struck late on Sunday, while images from the nearby town of Darbandikhan showed major walls and concrete structures had collapsed. At least 129 people were killed in Iran’s western province of Kermanshah on the Iraqi border, the provincial deputy governor told state television. 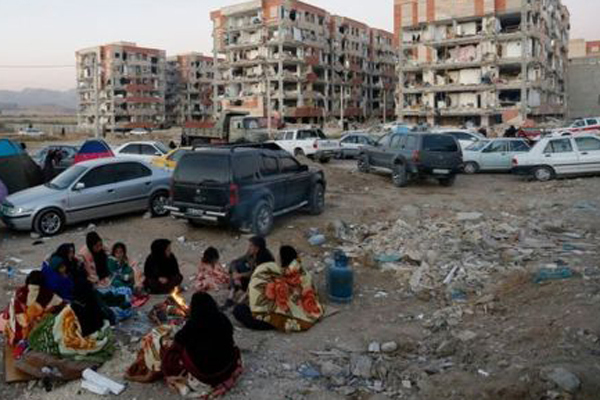 “We are in the process of setting up three emergency relief camps,” said Mojtaba Nikkerdar, the deputy governor of Iran’s Kermanshah province. The earthquake sparked panic, with fears of aftershocks sending residents out into the streets. The quake hit 30 km southwest of Halabja in Iraq’s Kurdistan at around 9.20 pm, when many people would have been at home, the US Geological Survey said. Six more were reported dead in Iraq. The death toll is likely to rise, the BBC report said. It was “difficult to send rescue teams to the villages because the roads have been cut off… there have been landslides,” he added. The town's main hospital was severely damaged, leaving it struggling to treat hundreds of wounded, state TV reported.